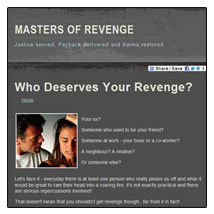 Revenge Toolbox | Get Your Revenge Right Now! We’re adding to our armory of revenge weapons every day, but we’re always keen on creative ideas. 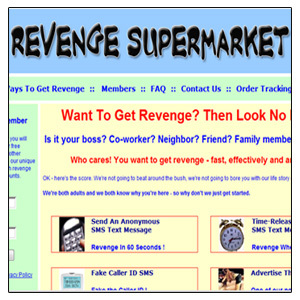 Please send us your revenge suggestion and if we like it, we’ll publish it and credit you, your website or blog. If it involves selling something, we’ll agree a commission on sales with you. If you link to us, let us know, and we’ll send you a free revenge item from our downloads to say thank you! 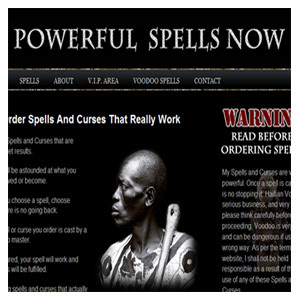 Enjoy our website, and if you like it, PLEASE share it! !